The U.S. Courthouse Building is located at Foley Square in New York City and was completed in 1936. 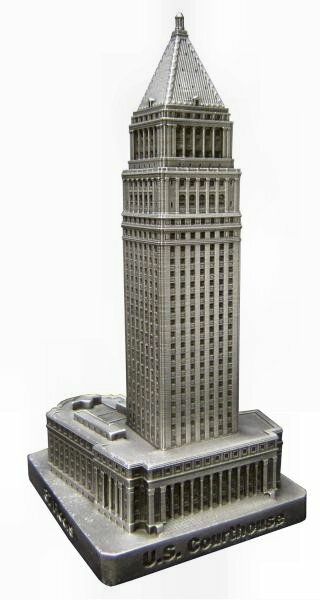 This building was designed by Cass Gilbert and stands 590 feet tall with 37 floors. The Courthouse stands in the area formerly known as Five Points, which was considered very dangerous in the 1800's, but is now the civic center of NYC. This pewter replica stands 6-5/16 inches tall and is finished in antique pewter. This model's scale is 1 inch = 100 feet. For more pics check out our special February blog.